Numbers from True Learning is an application designed to introduce toddlers to numbers (names and recognition), counting and sequencing. I recently did a review of True Learning’s Alphabet Air, an interactive matching game that introduces toddlers to letter names and sounds, and found that my two and half year old son Denver loved it. So, I was anxious to give Numbers from True Learning a try too. It is nice to see a few familiar apps being released for firmware 2.0. 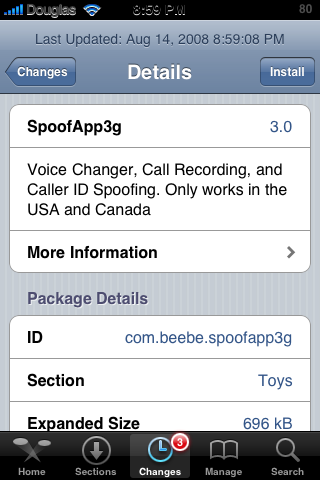 SpoofApp is an app that allows you to record calls, change your voice when making a call and change the display number when you make a call. There are a few change with the new version of the application. When you open SpoofApp, it will look basically the same. The Recordings option on the lower menu bar has a new icon and the Free Minutes button in the upper right corner has been changed to a Help option. When you open the Settings you will notice that they have changed slightly. Besides having a new look, there is also the option to turn on/off the Keypad Sounds. The Buy Minutes options has also improved. The cost of the minutes has not changed (prices listed below). You are also still able to get five free minutes.